From his debut No. 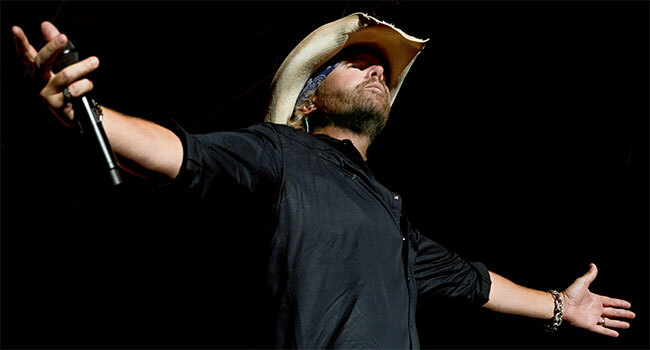 1 single “Should’ve Been A Cowboy” to the smash “As Good As I Once Was,” many of singer, songwriter and entertainer Toby Keith’s biggest hits have been inspired by casual conversations and accidental one-liners. But only one of Keith’s songs is born of a chat with Clint Eastwood. Keith’s December 7th single release “Don’t Let The Old Man In” isn’t just another fortuitous exercise in turning life into music, however. The song will also be featured during the end scene and closing credits of Eastwood’s upcoming film The Mule. The story of an older man who becomes an unwitting drug courier, the movie is the first Eastwood will star in and direct since 2009’s acclaimed Gran Torino. The connection began in May when Keith attended Eastwood’s golf tournament in Carmel, CA, and the two shared a cart. Keith asked Eastwood what he was doing next, to which Eastwood replied, “Funny you should ask, I am leaving tomorrow to shoot a movie for three months called The Mule.” Eastwood told him the storyline and Keith asked, “How do you do it, man?” Eastwood said, “I just don’t let the old man in.” With the movie in mind and the line Eastwood told him, Keith wrote the song and sent it to Eastwood, who loved it and decided to roll credits with it. Written solely by Keith and recorded at Nashville’s Ocean Way Studio, “Don’t Let The Old Man In” will be released to all digital retailers on Friday, December 7th.